I recently took a look at housing for the first time in six months or so, and I thought it was time to examine the stock market in similar fashion to see where we are. In my market commentaries and videos, I have continued to discuss the positive trends and healthy fundamentals—which are very real—but we also need to consider the broader context. The following three indicators paint a somewhat cautionary picture. 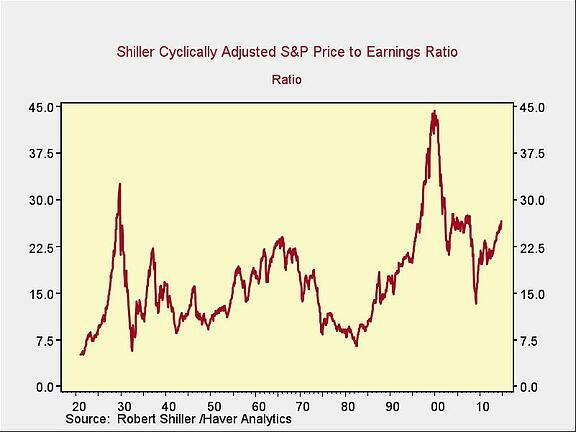 First, let’s consider valuations as measured by the Shiller cyclically adjusted price-to-earnings ratio, which uses the current price divided by the average earnings over the previous 10 years. You can see from the following chart that we’ve exceeded the current level in only three prior periods—the 1920s, the late 1990s, and the mid-2000s. I don’t think I have to tell you about what happened in the periods that followed. Next, let’s look at the amount of money borrowed to buy stocks and bonds. 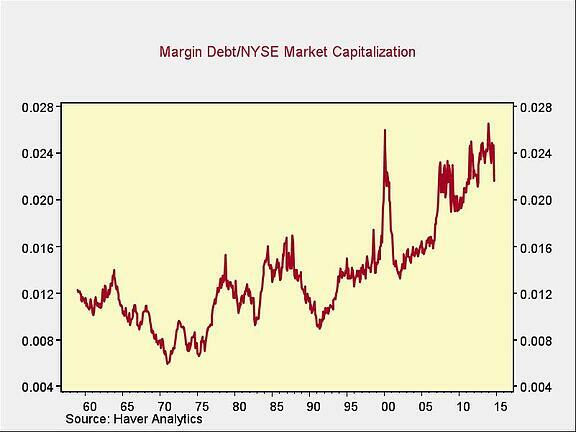 The best way to measure this is to take the total amount of debt and divide it by the dollar worth of the market (i.e., its capitalization). Our data set isn’t as long here, but the chart shows that current debt is clearly higher than it has been at any point since 1999—and, more recently, 2007—despite the recent decline. The problem with debt is that it still has to be repaid even if prices go down, and selling to pay that debt can drive further declines. The recent pullback in the debt level may, in fact, be partially due to investors trimming their borrowing as a consequence of the October pullback. 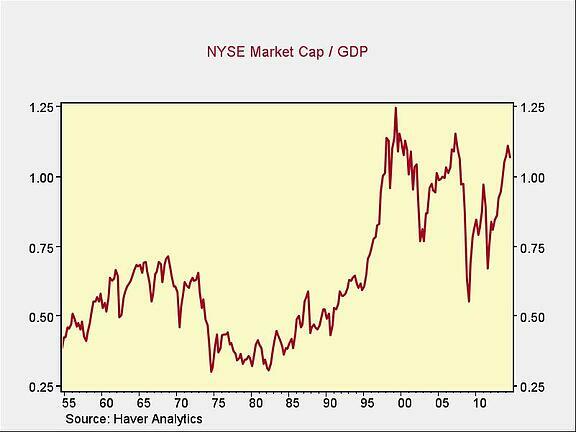 Finally, there is the Warren Buffet indicator—so called because it is a stat he is reportedly fond of—which looks at the ratio of stock market capitalization to GDP. This gives us the value of the stock market as a percentage of the economy as a whole. Once again, we see that we are at the highest levels since 1955, with the exception of 2000 and 2007. We are now three-for-three on very high valuation and risk metrics for the stock market. None of this is to say that the market will turn down any time soon; as we saw in the late 1990s and 2000s, the market can keep rising even when valuations are high. But it does mean that the level of risk is increasing. And with these three indicators at levels above almost everything we’ve seen before the last 15 years, we’ll have to move even higher above historical levels and into uncharted territory for the trend to continue. Unlike housing, which thoroughly repriced and is now growing at sustainable rates, the stock market arguably never really bottomed. Instead, it bounced back to grow at unsustainable rates and is now either at or approaching its previous peaks. I suspect that the positive trend will continue through the end of the year—and quite possibly for some time thereafter. But per the quote from Herb Stein that I shared the other day, “If something can’t go on forever, it will stop.” The question is when and how it will happen. Tune into Bloomberg Radio's Bloomberg Businessweek on Wednesday, May 22, at 3:45 P.M. to hear Brad talk about the markets. Stream the show live at https://www.bloombergradio.com/, listen through SiriusXM 119, or download Bloomberg's app, Bloomberg Radio+. The information on this website is intended for informational/educational purposes only and should not be construed as investment advice, a solicitation, or a recommendation to buy or sell any security or investment product. Please contact your financial professional for more information specific to your situation. Certain sections of this commentary contain forward-looking statements that are based on our reasonable expectations, estimates, projections, and assumptions. Forward-looking statements are not guarantees of future performance and involve certain risks and uncertainties, which are difficult to predict. Past performance is not indicative of future results. Diversification does not assure a profit or protect against loss in declining markets. 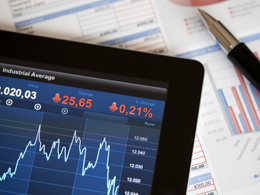 The S&P 500 Index is a broad-based measurement of changes in stock market conditions based on the average performance of 500 widely held common stocks. All indices are unmanaged and investors cannot invest directly into an index. The MSCI EAFE Index (Europe, Australasia, Far East) is a free float‐adjusted market capitalization index that is designed to measure the equity market performance of developed markets, excluding the U.S. and Canada. The MSCI EAFE Index consists of 21 developed market country indices. Third party links are provided to you as a courtesy. We make no representation as to the completeness or accuracy of information provided at these websites. Information on such sites, including third party links contained within, should not be construed as an endorsement or adoption by Commonwealth of any kind. You should consult with a financial advisor regarding your specific situation.